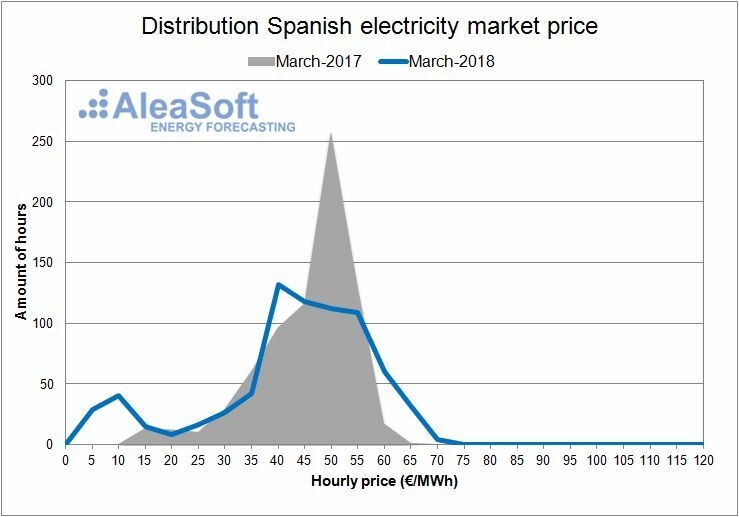 April 12th, 2018.- The average price of the Spanish wholesale electricity market MIBEL in the first quarter of 2018 has been 48.13 €/MWh, 7.47 €/MW lower than the same quarter last year. This price decrease has been due to the increase of the hydroelectric and wind energy production at the expense of the decrease of the electricity production with more expensive technologies like coal-fired plants, which have reduced their production compared to the same quarter of 2017. 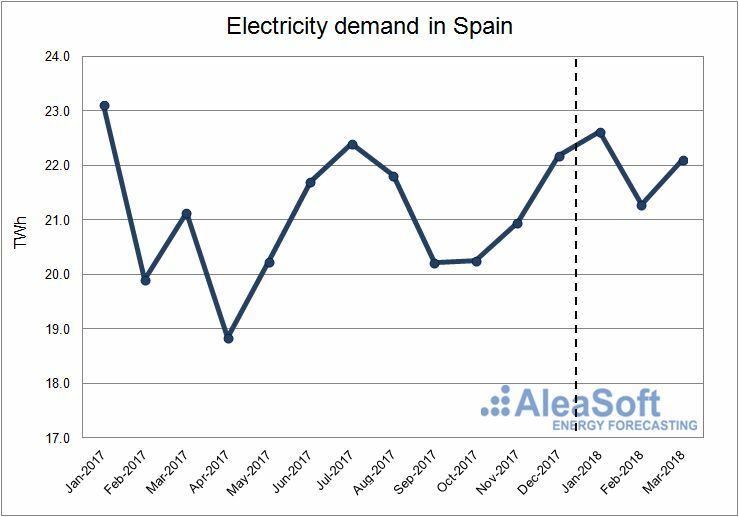 According to data published by REE (Red Eléctrica de España), the electricity demand in mainland Spain in the first quarter of 2018 has increased 2.9% compared to the same quarter last year, 2.0% corrected by the effects of temperature and working-day patterns. Although in January the demand decreased 2.1% over January 2017, in February and March the demand increased 6.9% and 4.7% year-on-year, respectively. This behaviour is explained basically by the registered temperatures, which in January have been higher than the historical average and 1.9°C higher than in January 2017, while in February and March 2018, they have been lower than the historical mean and 3.1°C and 1.2°C lower, respectively, than the corresponding month of the previous year. Evolution of electricity demand in Spain. In the first quarter of 2018 the wind energy production has been 22.2% higher than in the same quarter of 2017. March has been the month with the highest year-on-year growth, 64.0%, and it positioned itself as the month with highest wind energy production since 2007, with 7 690 GWh produced. According to REE data, the mainland installed wind power capacity has increased 29 MW until March this year compared to the installed power at the end of 2017. 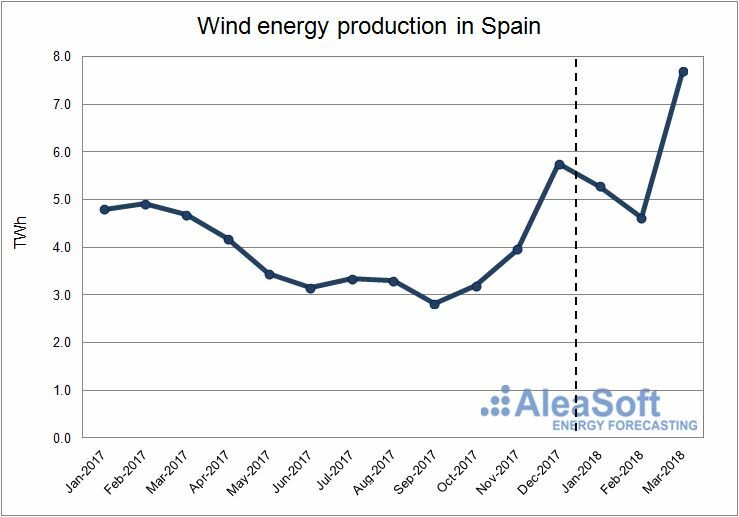 Evolution of wind energy production in Spain. The hydroelectric production has also increased in the first quarter of 2018: 29.4% in a year-on-year basis. After a period of drought that began in late 2016, the production with this technology is growing again and in March 2018, with 4 380 GWh produced, it is at similar level- to March 2016, before the drought. 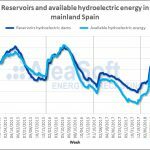 According to data published by the Spanish Ministry of the Environment, Farming, Fishing and Food, on April 9th, 2018 the reservoirs volume in hydroelectric dams in mainland Spain reached 13 401 hm3, and the hydroelectric energy calculated, theoretical maximum available, was estimated at 13 506 GWh. 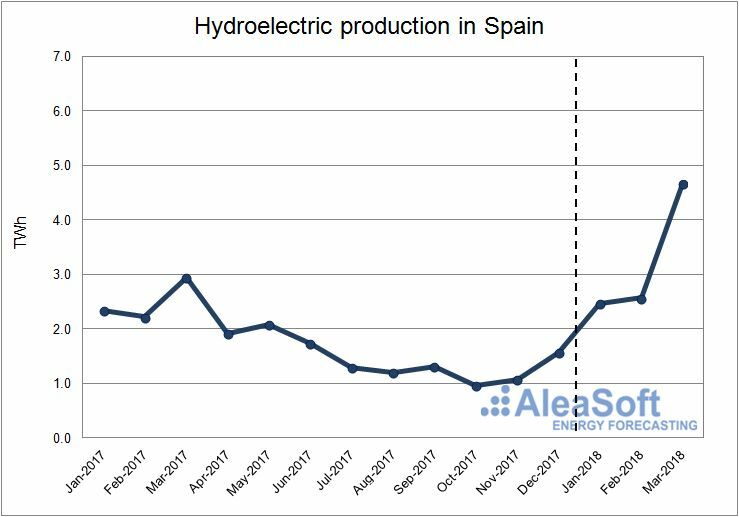 Evolution of hydroelectric production in Spain. The nuclear production in the first quarter of 2018 has been 7.5% lower than in the same quarter of 2017. During this period, there have been several nuclear outages in Spain: Cofrentes nuclear plant, one week in January and one week in February, and Vandellós II nuclear power plant, shutdown since the beginning of March. 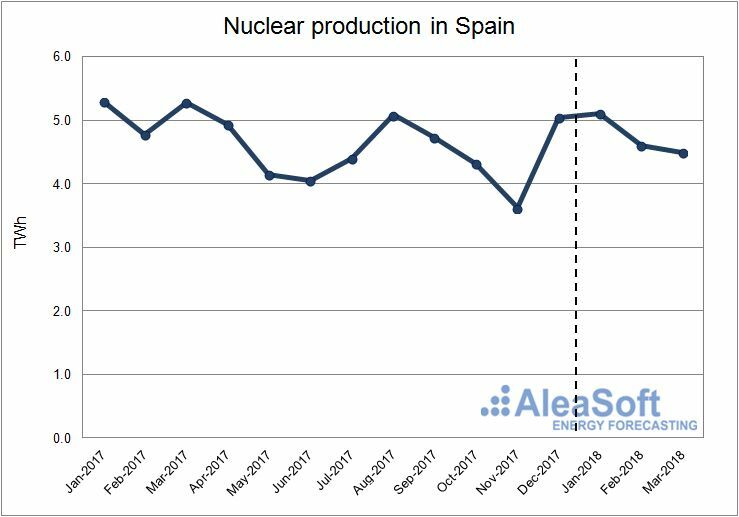 Evolution of nuclear production in Spain. The generation of electricity using coal has decreased 23.5% in the first quarter of 2018 compared to the same period of 2017. The main cause of this decrease is the increase in the production with renewable technologies such as hydroelectric and wind energy. 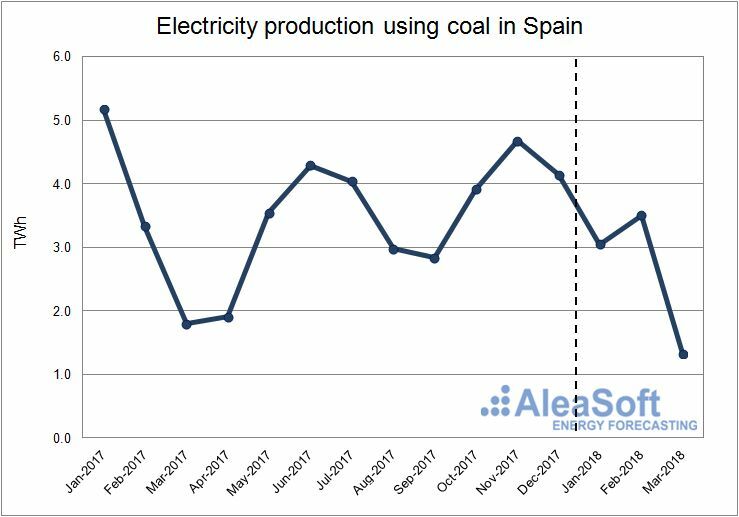 Evolution of electricity production using coal in Spain. Also the electricity production of the gas-fired combined cycles has been affected by the increase in hydroelectric and wind energy production in the first quarter of this year. The production using this technology has dropped 7.4% in year-on-year terms. 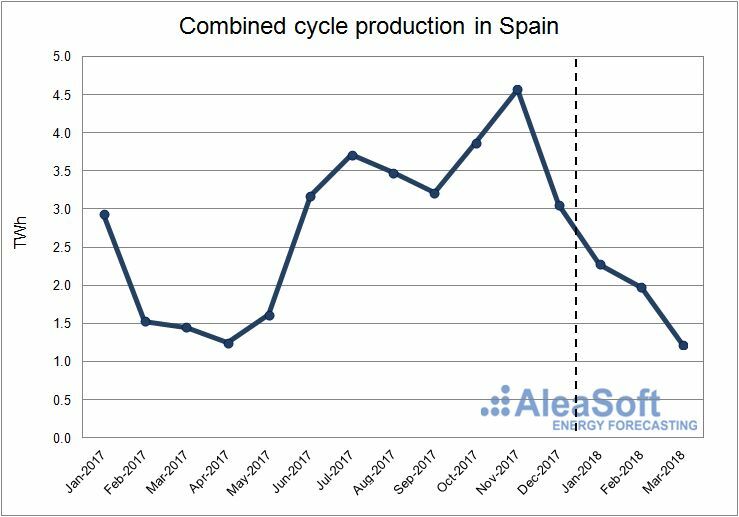 Evolution of combined cycle production in Spain. The solar photovoltaic production for the first three months of 2018 has fallen by 6.3% compared to the same period of 2017. Until March of this year, the installed capacity of this technology has not changed compared to what was installed at the end of 2017. 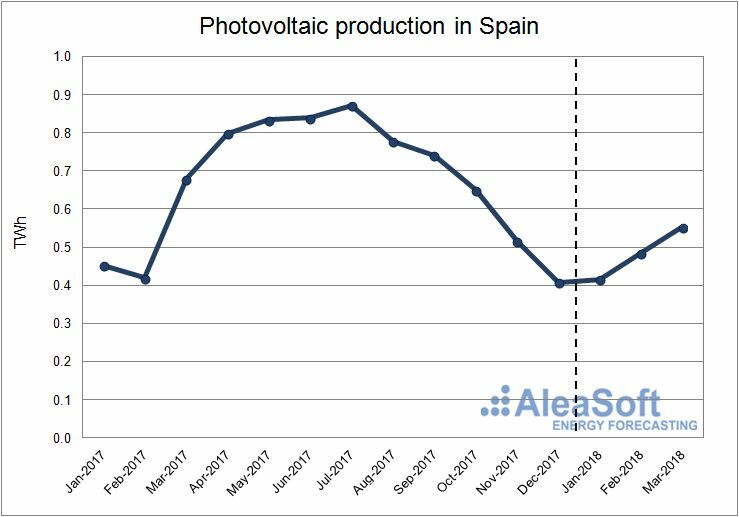 Evolution of solar photovoltaic production in Spain. In the case of solar thermal production, there has been a decrease of 1.5% in the first quarter of 2018, when compared to the same period of the previous year. However, in February 2018 this technology has registered an increase of 159.0% compared to February 2017. According to REE data, in the first quarter of 2018 no MW of this technology has been installed compared to what was available at the end of December 2017. 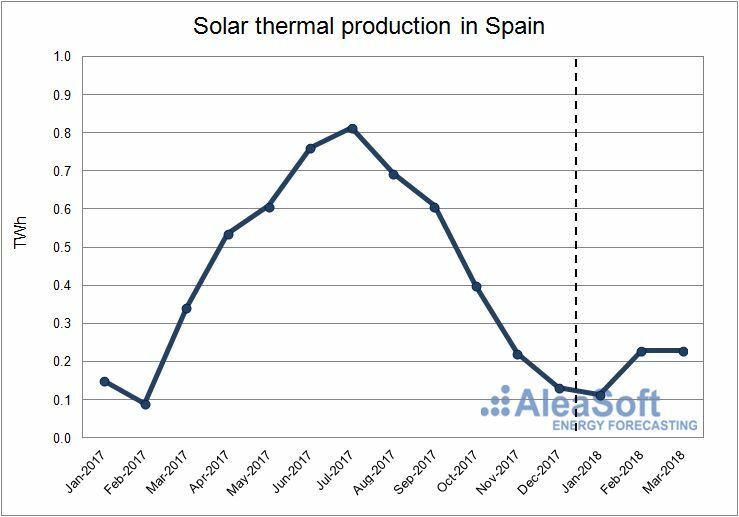 Evolution of solar thermal production in Spain. 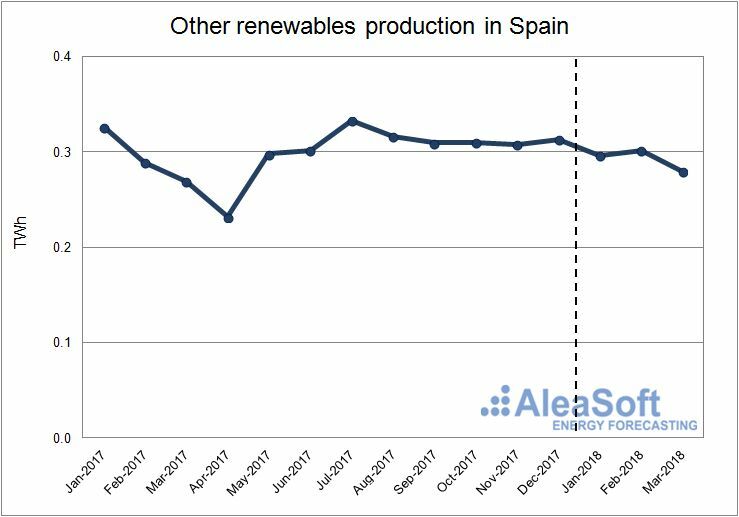 The other renewable technologies, including biogas, biomass, offshore hydroelectric and geothermal, have decreased their production in the first quarter of 2018 by 0.7% compared to the same period of 2017. This decrease is due to the fact that in January this year the production with these technologies has been 9.1% lower than in January 2017. However, in February and March of 2018 there has been a year-on-year growth of 4.4% and 3.9% respectively. Until March 2018, the installed capacity of these technologies was the same as at the end of 2017. Evolution of production using other renewable technologies in Spain. The cogeneration production in the first quarter of 2018 has grown 2.5% compared to the first quarter of the previous year. According to REE data, the installed power of this technology at the end of March 2018 was the same as at the end of December 2017. 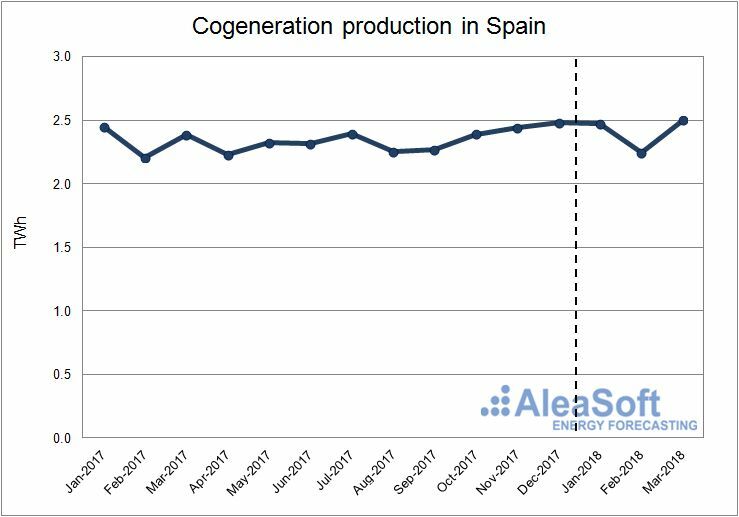 Evolution of cogeneration production in Spain. Production using waste has grown 5.9% in the first quarter of this year. Year-on-year growth has been 5.1%, 7.1% and 5.5% for January, February and March, respectively. Until March 2018 the installed capacity of this technology was the same as at the end of December 2017, according to data published by REE. 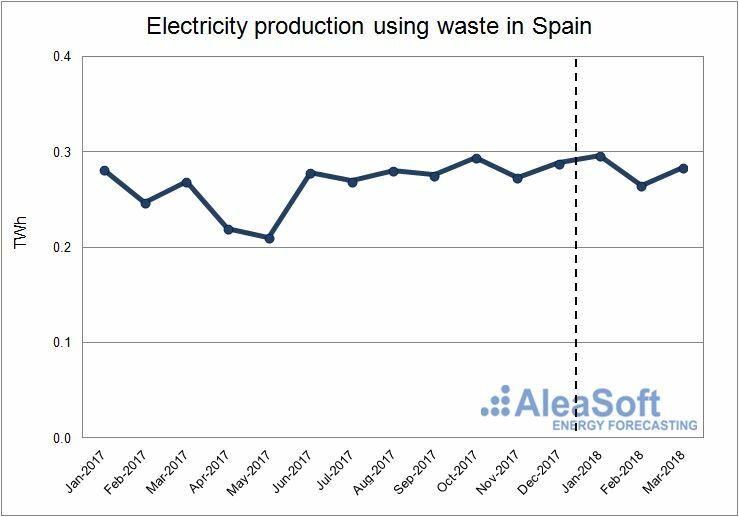 Evolution of electricity production using waste in Spain. 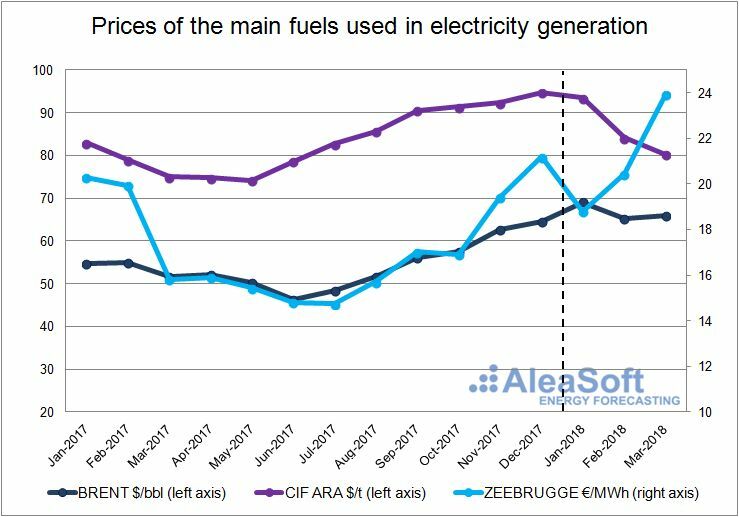 In the first quarter of 2018, the prices of Zeebrugge gas and Brent oil has increased with respect to the last quarter of 2017, while the price of the European coal CIF ARA has decreased. The price of Zeebrugge gas has stood at 21.08 €/MWh on average in the first quarter of 2018, 1.91 €/MWh higher than in the previous quarter. This increase was mainly due to an increase in the price in March, when it reached 23.92 €/MWh, mainly due to an increase in gas demand at the beginning of the month caused by meteorological phenomena called “Beast from the East” and “Storm Emma”, which also put countries like the United Kingdom at risk of running out of gas reserves. In January, the price of a barrel of Brent oil reached $69.08 on average, continuing the upward trend that had been occurring in the price of this fuel since the second half of 2017. In February the price of the barrel fell to $65.32, a price that was still higher than the monthly maximum of the previous year (64.46 $/bbl in December 2017) and in March the price of the barrel has risen again to $66.02. The price of European coal CIF ARA, has maintained a downward trend during the first quarter of 2018. The average price of a ton of coal has been $85.97, $6.81 lower than in the last quarter of 2017. Evolution of the price of the main fuels used in electricity generation. Data source: BRENT – EIA, CIF ARA – EEX, ZEEBRUGGE- PEGAS. 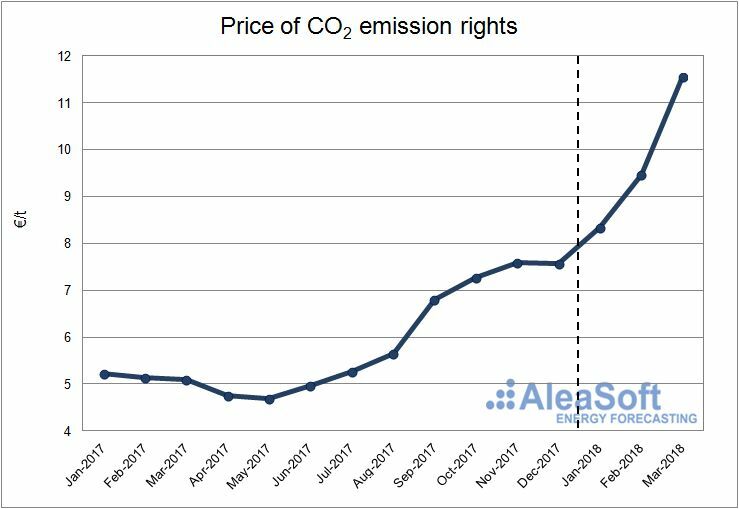 The price of CO2 emission rights has started the year with a sustained growth reaching 11.55 €/t in March 2018. The average price of the first quarter of 2018 has been 9.77 €/t, 2.29 €/t higher than the average price of the last quarter of 2017. This price increase is related to the reform of the CO2 emissions trading system (ETS), which will begin to be applied in 2021 and which aims to reduce greenhouse gas emissions. Evolution of the price of CO2 emission rights. The overall net balance for the first quarter of 2018 is 838 GWh imported from Portugal. This result is mainly due to March in which the net balance was 860 GWh imported from Portugal. 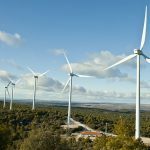 According to REN, the Portuguese System Operator, in March the generation of electricity using renewable energy in Portugal (4 809 GWh) exceeded the electricity demand of that month (4 650 GWh). 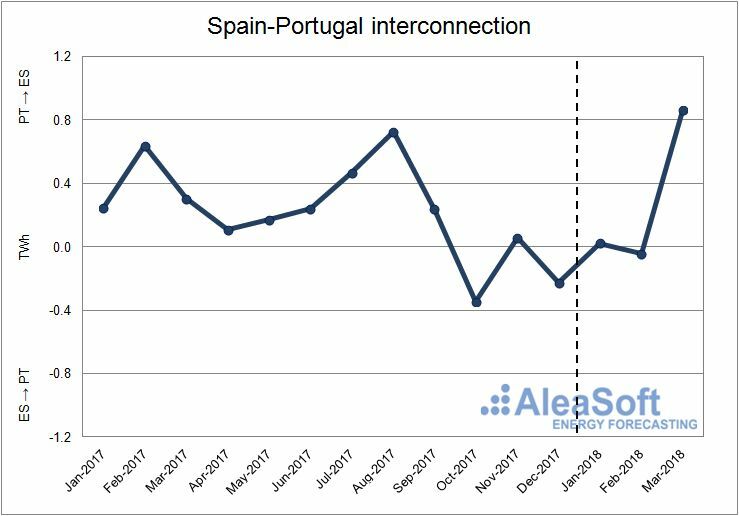 Evolution of the monthly net balance of the interconnection between Spain and Portugal. Positive values indicate that Spain imports electricity from Portugal, while negative values indicate that Spain exports electricity to Portugal. Data sources: ENTSO-E and REE. 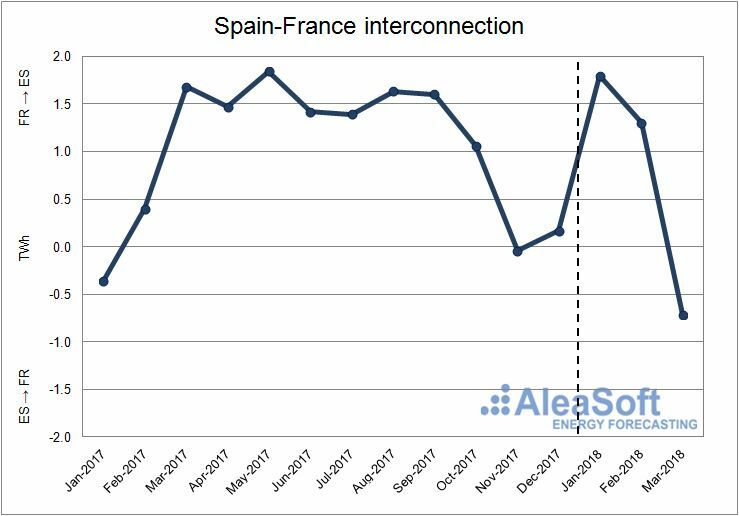 The net balance of electricity exchanges between Spain and France during the first quarter of 2018 placed Spain as a net importer with 2 393 GWh imported from France. However, in March, Spain exported 713 GWh net to France. Evolution of the monthly net balance of the interconnection between Spain and France. Positive values indicate that Spain imports electricity from France, while negative values indicate that Spain exports electricity to France. The average price of the Spanish electricity market, operated by OMIE, in the first quarter of 2018 has been 48.13 €/MWh, 7.47 €/MWh lower than the same quarter of 2017. January has been the month with the higher year-on-year fall, standing at 49.98 €/MWh, 21.21 €/MWh lower than in January 2017, a period that was affected by the French nuclear crisis. In March the price, of 40.18 €/MWh, has also been lower than the one of the same month of the previous year: ‑3.01 €/MWh. However, February, with an average price of 54.88 €/MWh, has been 3.14 €/MWh higher than February 2017. 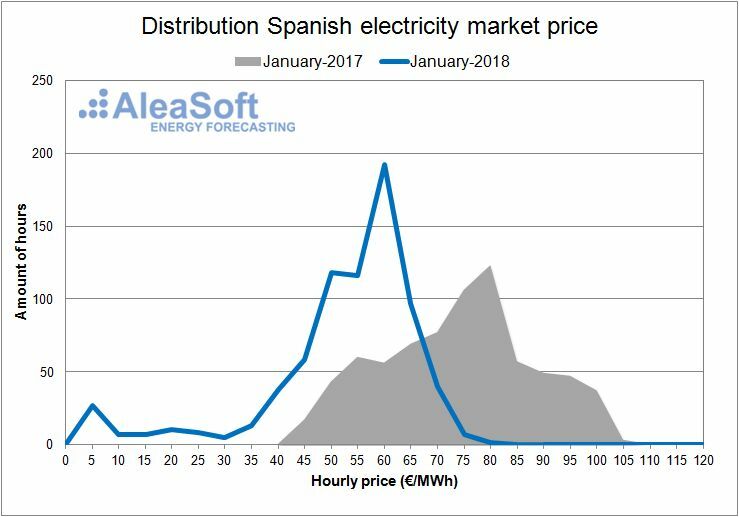 The minimum hourly price was recorded on January 1st, 2018 between 5am and 8am and was 2.06 €/MWh. We must go back to 2014, where there were several hours with zero price, to find a minimum price lower than the one of this quarter. The maximum hourly price of the first quarter of 2018 was registered on January 7th between 9pm and 10pm and was 77.71 €/MWh. 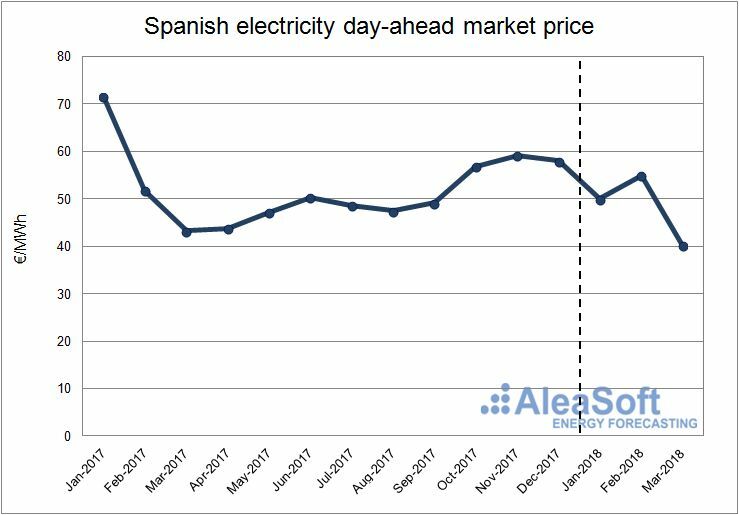 Evolution of Price of the Spanish electricity day-ahead Market. 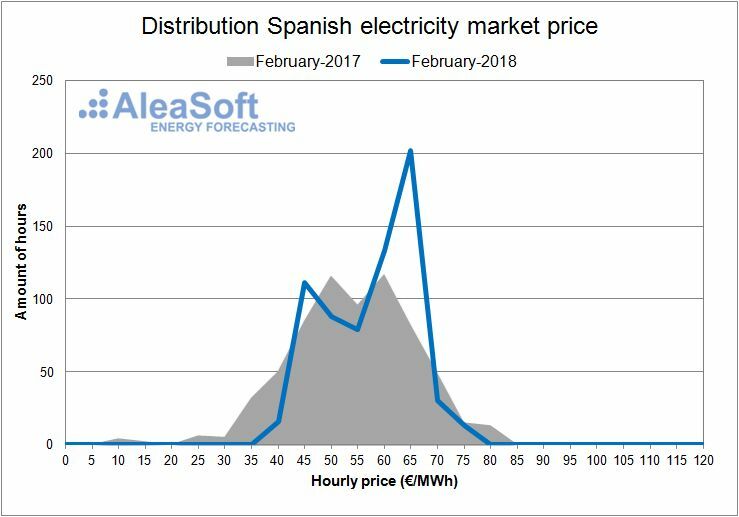 In the graphs showing the distribution of Spanish electricity market hourly price for the first three months of the year 2018, it can be observed that, with the exception of February, prices are displaced towards lower values than 2017. Distribution of the hourly price of the Spanish day-ahead market. 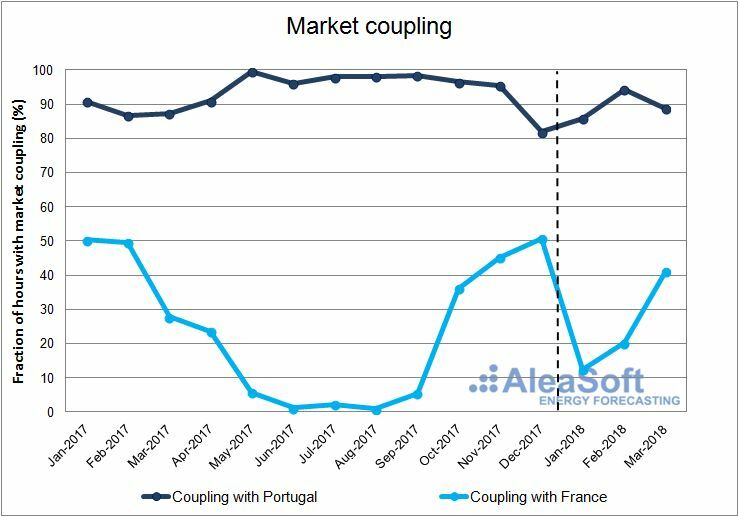 During the first quarter of 2018, the coupling with the Portuguese market occurred the 90% of the hours, while with the French market only occurred the 25% of the hours. Evolution of the monthly fraction of hours with market coupling with Portugal and with France. Data sources: Prepared by AleaSoft from data published by OMIE.